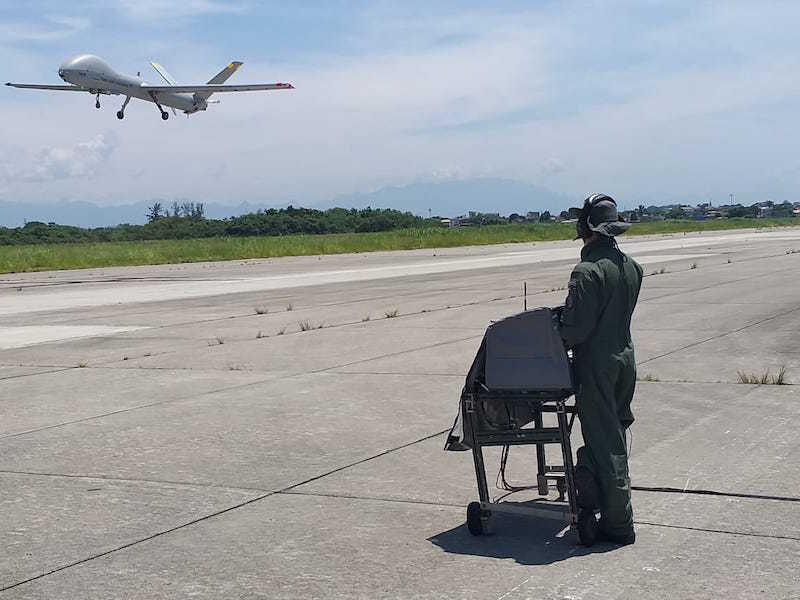 The Brazilian Air Force on Dec. 5 carried out the first flight of a remotely-piloted aircraft guided by satellite. Five crewmembers and three support personnel from the Horus Squadron (1st / 12th GAV), based in Santa Maria (RS), performed flight with the RQ-900 Remotely Controlled Aircraft (RPA) flight at the Afonsos Air Base in Rio de Janeiro (RJ). The objective was to validate the satellite control system of that aircraft. The new system allows the operator to pilot the aircraft and receive the images from its sensors through a satellite connection. Thus, the antenna now points to the satellite, and no longer directly at the aircraft, which links to the RPA, as Squadron Communication Officer Captain Aviator Lucas Gazzi Diaz pointed out. "Until today this was done only by means of an antenna that stays in the ground, an operation that requires maintaining direct, line-of-sight contact with the aircraft. That creates some distance limitations for aircraft operation, because as the distance between aircraft and ground station increases, the aircraft begins to fall below the horizon, interrupting the line of sight," he says. The infrastructure for piloting of the Remotely Pilot Aircraft remains the same, through shelters where the operators stay. "The changes are the installation of a new antenna in the aircraft and another one connected to the shelters, besides some computer equipment of computer, like new modems. Moreover, depending on the mission, we can still operate in the previous way," says the Captain. "The new system greatly increases the FAB’s operational aviation capabilities," the official adds.